The educational initiative “was humanizing when every aspect of imprisonment is dehumanizing,” says a former participant. In a makeshift classroom at a correctional facility in Southern Ontario, some 20 students – half of them incarcerated at the facility – sit in a circle alongside a professor. While the professor is responsible for framing discussion topics and structuring class activities, students are encouraged to direct comments at their peers, linking personal perspectives and experiences to the class readings. 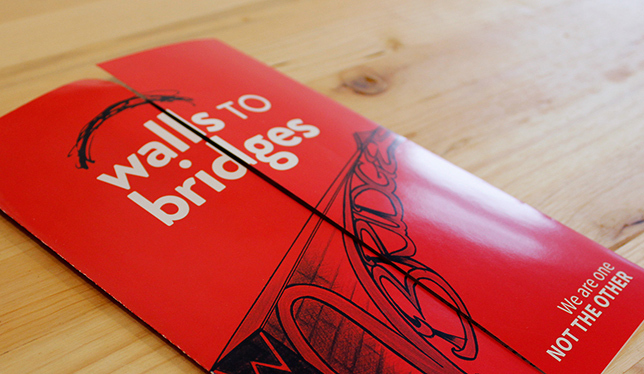 The students are participating in the Walls to Bridges (W2B) program, which was launched by the faculty of social work at Wilfrid Laurier University in 2011. It is an offshoot of the U.S. Inside-Out Prison Exchange Program, a partnership between American institutions of higher education and correctional systems founded in the late 1990s. W2B has offered 40 university courses to date in Ontario and Manitoba, reaching upwards of 700 “inside” and “outside” students. “We have a group of instructors and alumni that meet every two weeks, and one of our main functions is to provide a five-day annual training for educators interested in learning our teaching model and how to establish W2B classes at their home institutions,” said Shoshana Pollack, a professor of social work at Laurier and the W2B coordinator. Over the past year, for-credit courses have spanned the fields of women’s studies, English, philosophy, criminology and social work, to name a few. The participating universities are University of Winnipeg, University of Waterloo, University of Windsor, University of Toronto, York University, Ryerson University and Laurier – the latter serving as the national hub for W2B thanks to the support of the Lyle S. Hallman Foundation. The courses are held at five participating provincial correctional facilities, as well as the federal Grand Valley Institution for Women in Kitchener, Ontario, which serves as the flagship site for W2B. According to Dr. Pollack, this is possible thanks to a sense of civic responsibility and community engagement on the part of educational institutions. “All classes end with a final ceremony in which students receive a certificate of completion. Inside students don’t have to pay tuition because the universities who are involved are all committed to absorbing the cost of the course, as well as paying for their books.” Universities further support W2B with flexible admissions requirements for inside students, and by allowing professors to teach courses as part of their regular workload despite the small class sizes. Rachel completed two W2B courses prior to her release. She has since been admitted to the PhD program in criminology at the University of Ottawa, where she is looking forward to starting in the fall. W2B is not about providing students from outside the correctional system with the opportunity to mentor or help criminalized individuals, said Dr. Pollack. Nor is it merely about transcending the physical walls of prison. Rather, she said, W2B creates collaborative learning communities within correctional settings so that university and incarcerated students may pursue for-credit courses and learn the class material together through dialogue and experiential methods. 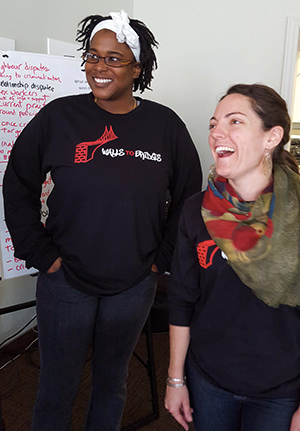 Two students participate in the Walls to Bridges program. If this seems innovative, even cutting edge, that’s because Correctional Services Canada and their provincial counterparts are well behind other countries in terms of evidence-based rehabilitation practices, said Michael Bryant, former attorney general of Ontario and currently executive director of the Canadian Civil Liberties Association (CCLA). Mercedes Rowinsky-Geurts, an associate professor of Spanish at Laurier and a 3M National Teaching Fellow, set up Inspiring Futures, a W2B bursary fund to support the reintegration of former inside students by assisting them with their studies upon their release. Tiina, who completed two W2B courses of her own since attending her friend’s closing ceremony, went on to pursue an MSW and is the first recipient of the award. Each year, W2B works with the office of the registrar to raise money, but funds are limited. Nevertheless, there are many success stories of individuals – criminalized and not – whose lives have been transformed by their W2B experience, said those involved. None of this would have been possible if not for the generosity of socially conscious donors and the work of committed educational reformers and volunteers.